A Blog Completely Dedicated to Harvest Moon and Android Games. A few days ago, I tried to play Bokujo Monogatari series currently developed by Marvelous, the Story of Seasons: Trio of Towns. So I thought to write a little about what I got for now. 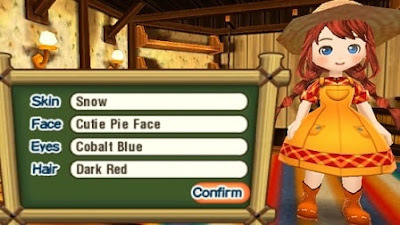 This is a little walkthrough at the beginning of the game and how to set your character in Story of Seasons: Trio of Towns. Well, the game opened with an introduction scene, I think that was very cool animation. After watching the introduction, or press any key to skip it, tap the screen, and then select New Game. You will be prompted to choose whether you want to play in Seedling Mode or Veteran Mode. You can not change this mode later. What's the difference between the two of them? 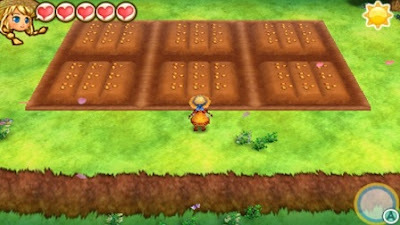 The seedling mode is perfect for people who have never played Story of Seasons or Harvest Moon games before, or for those of you who want to get less challenge. In Seedling Mode, certain items in the store (equipment, livestock, and grocery store) will be cheaper, and when you use the tool, it will consume less stamina than the Veteran Mode. Next, you will be asked to choose whether you want to play as a Boy or Girl. You can not change it again later. Then you can customize your character's appearance as you want. You can choose one of 5 skin colors, 10 facial expressions, 16 eye colors, and 22 hair colors. You will be able to change your appearance, after certain events in the game. Types of Personality: What Personality is the Best? The character personality will give you a bonus of small profit early in the game. Your character personality cannot be changed after you select it. So choose wisely or just choose the type of personality that is most beneficial to you. 1. Animal Lover: When you get a new animal or pet for your farm, either newly born or bought, the animal will have a heart of friendship. 2. Angler: You will have a higher initial fishing level and you catch a higher star level fish as well. 3. Sports Enthusiast: You will start the game with 6 heart stamina, the original only five hearts. However, you will never be able to get more than 10 hearts of stamina in the game, no matter how much stamina you have at the beginning of the game. 4. Tycoon: Your farming adventure will start with 50,000 G instead of 4000 G (2000 G when Frank gives you tools, and 2000 G when Frank explains about animals). I choose this because I know getting a lot of money in the beginning, in this type of game is really hard and important. 5. Charmer: Everyone you meet before will have a friendship bonus or an additional friendship with you. All marriage candidates will start with 10,000 Friendship Points (1 heart), and other villagers will have 5000 FP (half 1 heart). You can see your friendship level with the villager through the bookshelves inside your house. You are dreaming when your mother, Marlena, took you to a farm when you were little. There you begin to know petting animal (a cow) and harvesting some fruit. At first, you're afraid of petting a cow, but you can do it because your mother assuring you is okay. You love rural life and want to live there. But suddenly, your young sister wakes you up for dinner. After dinner, your father, Daryl, says that your family has to move because of his job. However, you are mature enough to make your own decisions, so you say that you want to be a farmer and live independently. After arguing all night with your father, he finally agrees to let you become a farmer, allowing you to feel that the choice you made was wrong. The next day you will ride a country-style transport to go to Westown. There, you will meet your uncle, Frank. He will teach you many things to become a great farmer. The next day, you get a Westown tour by Frank. On the way to Megan's house, you will be introduced to wild plants that grow and you can take it if it's time. You will be introduced by a villager named Megan, then you are invited to the square (Westown: North) to meet some villagers who live in the town and see the shops they run. Frank will let you go around on your own. Go upstairs if you want to know the location of the post office, restaurant, florist, grocery store, and sheriff's house. If you are finished or already satisfied around, go south (down the area) to return to Frank's house. The next day, you are given a slum house and a ready-made farm. Frank asked you to name your farm. You can change it later through the bookcase in your house. Frank asks if you have any questions or not. He can explain the various game mechanisms if you need them. He also tells you to place items into the shipping bin before 17:00 if you want to sell them, and you will be paid the next morning. As the game progresses, you will be able to change the destination of the shipping bin, to send items to other villages. After that, Frank will give you a Hoe, Watering Can, Axe, Sickle, Potato bread 10x, Radish seeds 5x, and 2000G. In the meantime, you are free to farm, plant all the radish seeds given by Frank. The farming mechanism is a little bit different from Harvest Moon games, so maybe you will need to adapt. Next, when you go to Westown: North, you will learn about part-time jobs to Horatio. That's it, not much I can explore from Story of Seasons: Trio of Towns for now. I hope this beginner's guide could be useful. Thank you. Droid Harvest is a blog completely dedicated to Harvest Moon and Android Games, from the tips, tricks, guides, and latest news you can get in here.